If you are good at video content creation, you can start creating high quality videos that may offer any learning tutorials, video logs, or any creative stuff that could capture the huge audience. If you are going to create the videos in your native language other than English, you may limit your viewership. So its recommended to create videos which can benefit everyone out. Or if its necessary to create the videos in language other than English, you can at-least offer English sub-titles. Since your earning potential will heavily depend on the success / viewership of your videos. You can create viral videos and share them on social networking sites like Facebook or Google Plus or even embed them on your own website / blog. Now you must be thinking how you are supposed to make money out of your video content? 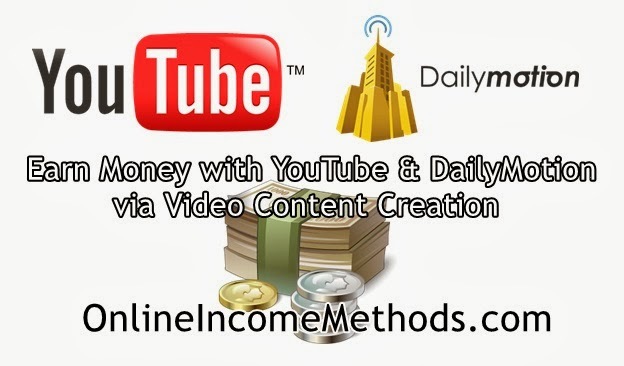 YouTube Partner Program & DailyMotion’s Publisher Program will help you out in earning money. Since both YouTube & DailyMotion are popular video sharing networks, they share certain revenue with their video content creators. YouTube & DailyMotion generate revenue with advertisements within the videos on eCPM or CPC basis, further the revenue is split up at certain percentage with the video content creators. In case your country is not supported by YouTube Partner program, you can join FullScreen.net that’s an alternative to YouTube Partner program. There are surely many video sharing sites which claim to share profit among their content creators, however I have only referred those which are famous & trust worthy to work with. Simply create an account with YouTube or DailyMotion video sharing website and start uploading your original creative video content. You must upload videos with regular intervals. You should create and upload minimum 10 videos before applying for the YouTube Partner Program & DailyMotion Publisher program. Bonus Tip: If you own a blog / website, you can add your blog’s link in description of your uploaded videos at YouTube or DailyMotion and start receiving free traffic / visitors on your blog / website. Further if you have high traffic blog you can embed those videos inside your blog posts to boost your video sharing revenue. Important Note: Please make sure to read the terms and conditions of each website, before you are going to start work. Do extreme care about copyrights of others and in case you are found to be a copyright violator, in terms of copying other’s content without their permission, you will definitely lose your current earnings as well as further chances to work with that website where you have been marked as a copyright infringer. If you are serious about learning, how to make guaranteed money from YouTube, you must invest some money on learning from top notch instructors who have years of experience in making money with YouTube, that way you will be able to learn quickly. The following YouTube course will also be applicable at other video streaming sites to make money such as DailyMotion. Subscribe to the following YouTube Money Making Video Course to get started.